Tiffany Colonial lamp has beautifully mottled dichroic glass panels which are all over green when unlit and golden-yellow with green mottling when lit. 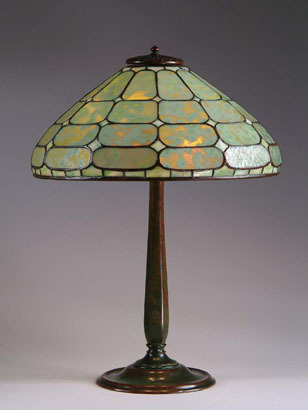 Shade is signed "Tiffany Studios New York 1684" and rests on a simple and beautiful Tiffany stick base, which is marked "Tiffany Studios New York 534". The base has a rich mottled green patina. SIZE: Shade is 16" dia."